Everything about a Quick Draw Competition is quick and this one is no different! Painting, Exhibition, Judging, Sale this event has it all! Students under the age of 18 are invited to paint out and have fun in downtown Easton. Participants must pay a $10 registration fee and “paint from life” between 10:30am-1:30pm. Artists must bring their own supplies and all artwork must be framed or matted (artwork created as part of the workshops is eligible as long as it is framed). Any framed and completed artwork should be displayed for judging and sale upon completion in front of the Bartlett Pear Inn on Harrison Street, Easton. 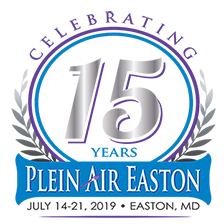 Plein Air Easton Competition judge Jill Carver will judge all submitted work beginning at 1:30pm with awards immediately following. A 10% commission will be taken on the sale of any paintings. Registration begins at 10am on Harrison Street.